TouchCarousel is a posts content slider WordPress plugin with touch navigation for mobile devices. 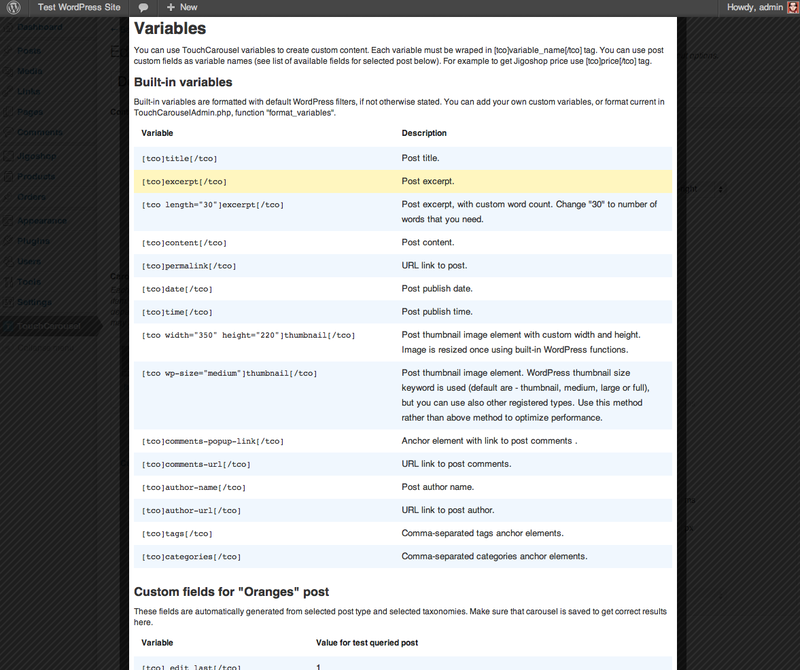 You can slide custom post types, with custom taxonomies (categories, tags, e.t.c.) and create layout templates using simple templating system. It’s created based on TouchCarousel jQuery plugin, selling on CodeCanyon. Please note that this plugin width can be resized dynamically on when snapping to items is off. If you wish fully responsive plugin, check my RoyalSlider. View demonstatrion video , or read plugin review by WP Hub. 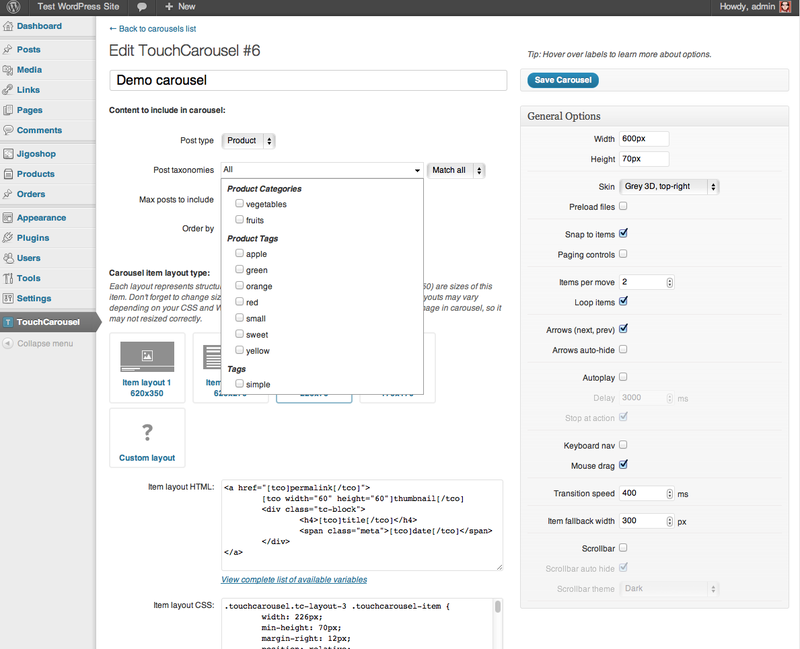 Select what taxonomies to include in carousel (categories, tags, e.t.c.). Select how much posts to display and order them by popularity or date. Display content from post meta custom fields. Create item layout with simple templating system with predefined variables (including list of custom fields for selected post type). 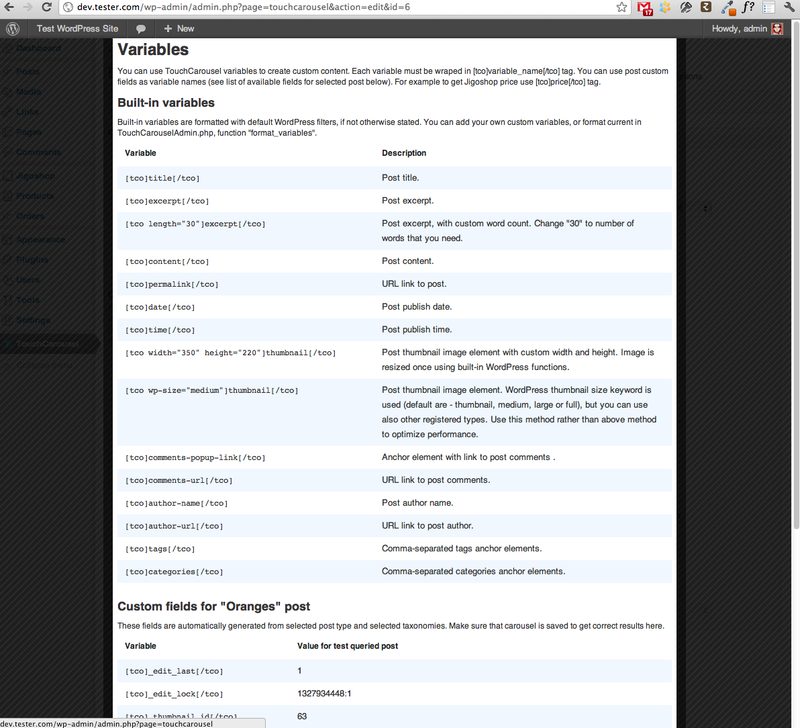 View screenshot of available variables in admin. Four pre-built layouts and five skins with photoshop files. You can edit them, or create your own. Multiple carousels per page is allowed. Smart auto play – pauses on hover and stops at any user action with carousel. Mouse drag navigation (can be disabled). Carousel can be embedded to page with php function, or shortcode, anywhere you want in your WordPress site. Uses as low number queries to get posts as possible, will not slow your site down. Post featured images are resized using built-in WordPress functions. Thumbnail keyword, or dimensions can be used to get thumbnail in layout template. WOW. THIS IS AMAZING! I always buy stuff from Envato and this is by far one of the BEST plugins I’ve ever purchased! Heck, it’s one of the best plugins I’ve ever used PERIOD! AMAZING! THANK YOU. Must admit, I was very impressed with it. it’s a great little slider. Creating a new carousel is incredibly easy. Crazy! It is just amazing, great job! p.s. : really… the best envato product! Layouts may vary depending on your theme CSS (but not much), skins are rendered exactly the same across any theme. Video inside carousel will block touch navigation, use lightbox to open it. You can use inputs inside carousel, but you should add “non-draggable” css class to them to allow default browser action. By purchasing this plugin you get free lifetime support and updates. For support please contact me through contact form on my profile page. jQuery 1.9.0 compatibility and iOS6 timer bug fix. Fixed issue that could break select of post type in WP 3.5 with some plugins. Fixed slider deleting issue in some rare cases. Fixed bug when zero posts found. Added complete WP multisite support. To get notified about plugin updates and new releases follow me on Twitter or join my email newsletter (unsubscribe at any time, mailchimp).